The construction of the Empire State Building in 1930—a display of “the great industrial frenzy of America” in a time of Depression and Prohibition—forms the background for this savage urban melodrama. 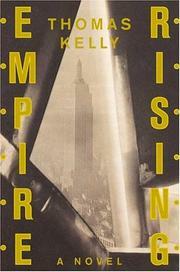 Like Kelly’s previous fiction (The Rackets, 2000, etc., his third novel is a knowledgeable, vigorously detailed portrayal of big-city political and fiscal skullduggery and corruption, featuring a generous host of brawling characters. Foremost among them are transplanted IRA terrorist Michael Briody, who divides his days and nights between sweating as an ironworker on the rising skyscraper, earning chump change as an amateur boxer, running guns to Ireland—and dallying with freelance artist Grace Masterson, the kept woman of NYC Mayor Jimmie Walker’s Deputy Commissioner of Buildings, Johnny Farrell (for whom she also makes illegal bank “drops” under various aliases). Kelly keeps it all moving, juxtaposing worksite scenes high above the city, meetings in miscellaneous smoke-filled rooms, hotel rendezvous between Grace and her married lover Farrell, and violence on the perilous streets where men marked by the city’s rival Irish, Italian, and Jewish mobs suffer “justice.” The supporting cast includes such nicely drawn presences as powerful racketeer Tough Tommy Touhey, crooked Judge Crater (tucked securely into Touhey’s pocket until he undertakes an ill-advised double-cross), and Briody’s firebrand Irish Republican landlord, Danny Casey, as well as in cameo appearances by Babe Ruth, a sexually frisky FDR, and heavyweight pug Primo Carnera. Alas, it’s all a little too familiar. Flamboyant as they are, the characters are mostly types, and their interactions genre-generic. Kelly does build considerable interest in the choices by which Grace and Briody ensure the destruction of the mutual happiness they seek. But we’ve seen it all before. Nevertheless, Kelly’s mastery of narrative drive holds the attention, and few who start this white-hot novel will fail to finish it.